Tattoos » Page 4 Now viewing page 4 of 7. 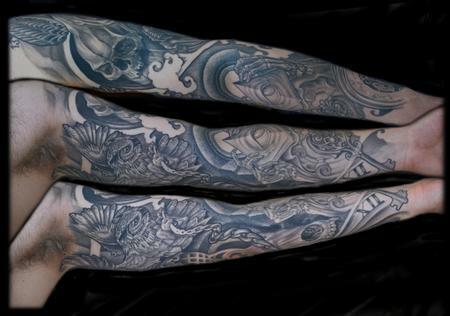 This is my first sleeve I've ever completed start to finish. It was such a powerful feeling when the moment came that both the client and I agreed it was finally finished. I had such a great journey working with Ryan. 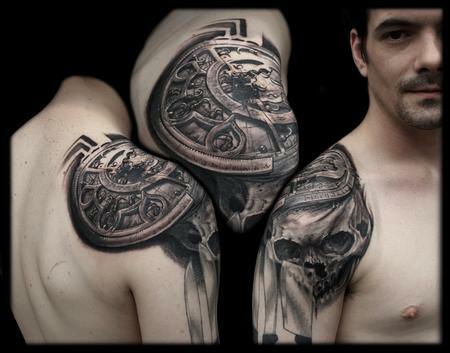 Ryan came to me with the idea of doing a more macabre/ momento mori tattoo. He wanted symbols to represent the irreversible countdown that has started from the leviathan of a society that we've created. every main image I wanted to link into the next but also stand alone as a narrative. I approached this tattoo like a story, I wanted to portray an overall emotionally evocative by piecing together individual chapters that not only flowed well over the body visually but comprehensively as well. Ryan and I both learned a lot from each other and grew during the over the year and a half process. 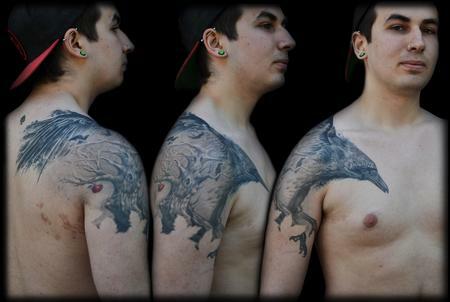 I'm very honored that he dedicated such a large area of his body to my work, and to have met such a solid guy. Here's a coverup I did a while back. The client came to me wanting to incorporate/ rework/coverup an existing clover tattoo he had gotten a while back dead center in on his arm. I had a really fun time doing this and working with a set/limited color palette. Here's the finished and healed picture of the abstract crow/raven and spooky tree wrapping arm tattoo. 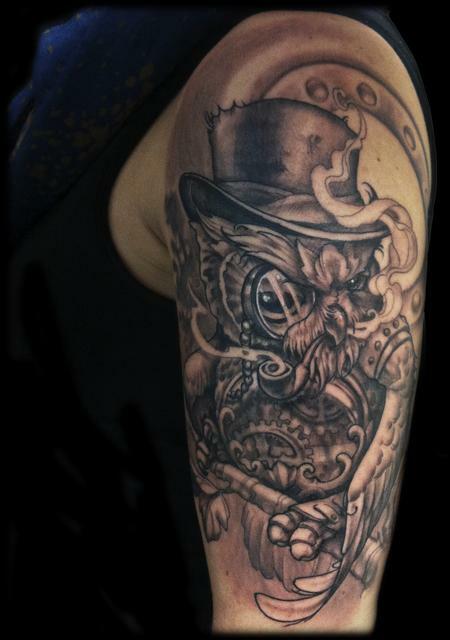 Had alot of fun with this one and felt like it was a breakthrough for me in my tattooing. It was one of the much more successful times I was able to apply alot of the knowledge that I'd picked up from the many guest artists that come through OTM-NE. Thank you for looking! 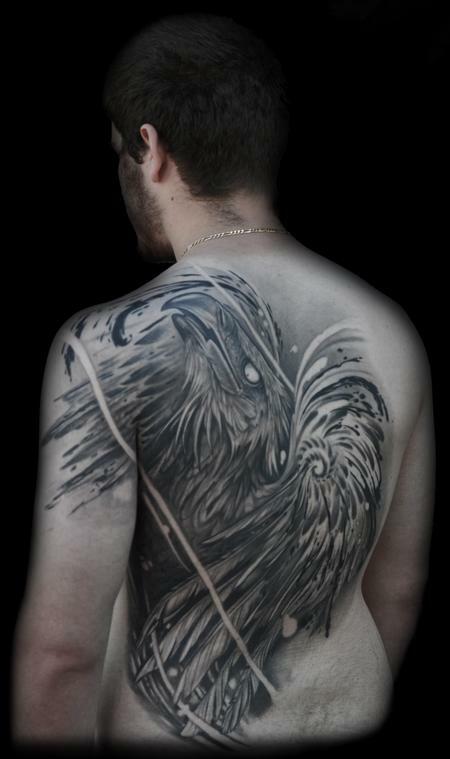 Had a lot of fun trying something different with this eventual full abstract phoenix backpiece tattoo. I wanted to create a sense of the firey chaos of the birth of the phoenix. I used alot of abstract paintery splatters, shapes and spiral movements contrasting with a rendered more realistic approach to the face and some of the feathers. Really happy with the result. This tattoo I had alot of fun with. Had a blast geeking outon all the little details and tried a few new techniques with the background and rendering the smoke. It's pretty straight forward. Hopefully I'll get one more pass at this and I'll repost a healed picture. Thanks for looking! 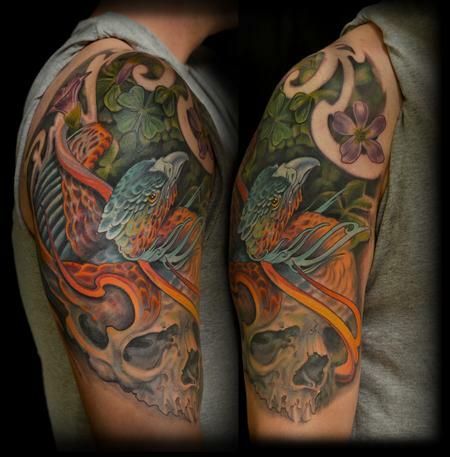 This is a cover- up tattoo I did a while back on an awesome client. 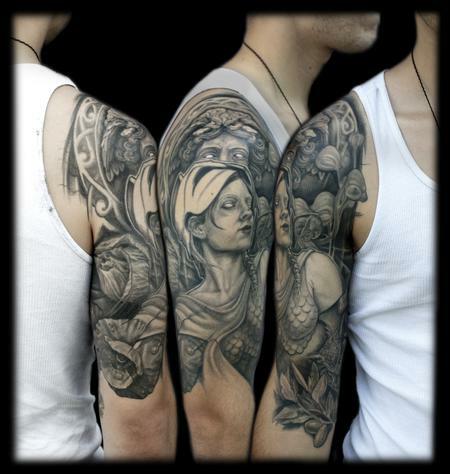 This was an amalgamation of elements that represented her time working at an orphanage in Thailand. 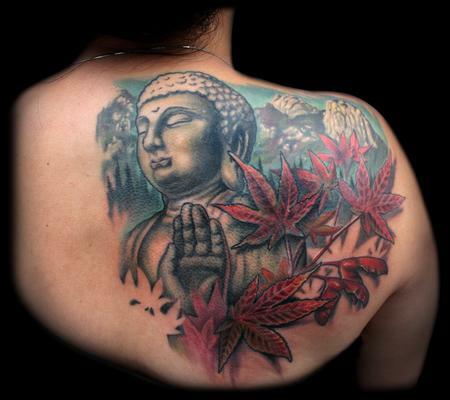 The Buddha was from a statue outside the complex, the mountains are the backdrop to the town,and the maple leaves transitioning to their autumn colors represents her time there. I thuroughly enjoyed doing this tattoo alot and really look forward to working with her again. Newest edition to the Puerto Rican Heritage sleeve tattoo. 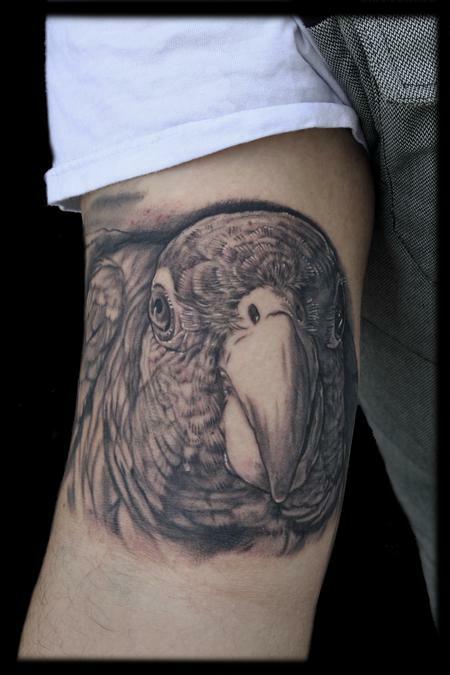 For the bicept, we went with a portrait of the Puerto Rican Parrot or Iguaca. Scary that there are only about 34-40 left in the wild and 143 in captivity. This year's benefit through TattooNow will be Endangered Species themed. You can bet that another Iguaca will find his way onto the flash sheets. 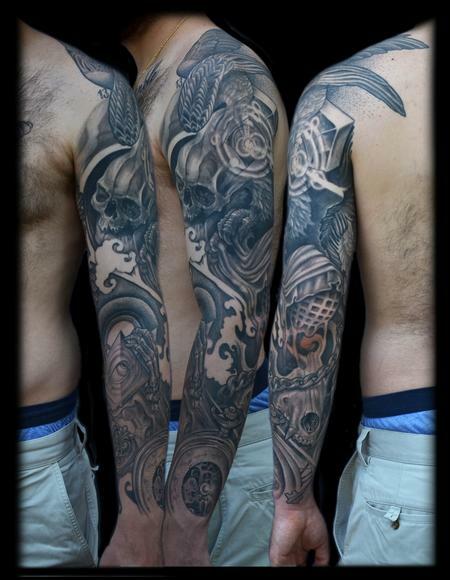 This is the interior view of the greek heritage sleeve that's in the works. 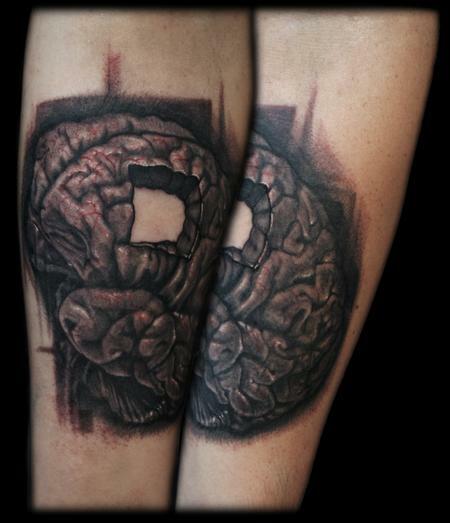 Here's a black and grey photorealistic brain tattoo. the client wanted a section missing which was an interesting addition and helped to break up the dense lobe structures. He also wanted to add the small blood vessels with I highlighted by using a little red color over the focused areas of the tattoo. Now viewing page 4 of 7.